On the Canadian VNC there are symbols, the meaning of I can't quite figure out. In the Nanaimo aerodrome there are several "star" symbols. The unfilled one shows the location of the aerodrome beacon. What do the other solid black star symbols mean? The one circled in red reads "S2 Fl R 209". Based on my knowledge of marine lights I thought that it could describe a red flashing light. The star symbol, being in an aerodrome could mean "limited hours" but even then, I'm not able to make sense of the rest of the description. What does the solid black star and "S2 Fl R 209" mean? EDIT: According to the CFS, the solid star is a hazard beacon light. Not sure how to decode the text. The hollow blue stars are for airport beacons. The solid blue star at an airport indicates part-time operation. Your question was on the solid black stars, and those are used to denote hazard beacons. Not the answer you're looking for? Browse other questions tagged aeronautical-charts transport-canada symbology or ask your own question. What does a dot inside two parenthesis mean on a weather depiction chart? 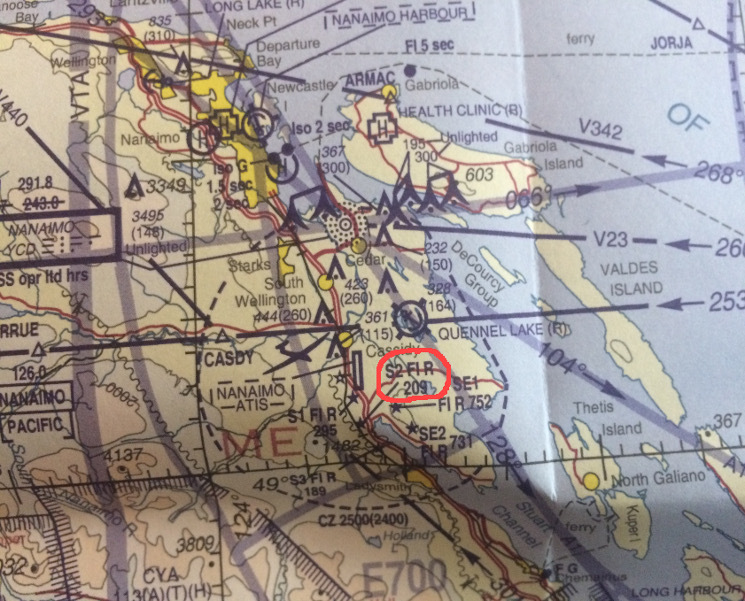 What is this black symbol on a VFR chart? What does the “D” symbol mean on this instrument approach chart? What does “MERMA” mean on the Los Angeles TAC chart?